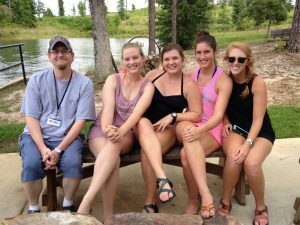 On July 7-9, 2017, Auburn University students from Special Education, Rehabilitation, and Counseling (SERC), along with students from the College of Education’s School of Kinesiology, volunteered for a Camp Autism Respite Event (CARE) at Children’s Harbor on Lake Martin. The students spent one-on-one time with children on the autism spectrum while parents attended classes presented by professionals. The event was put together by the Lee County Autism Resource and Advocacy Group (LCARA). ​The students seated are (L to R) Michael Delano, Leah Eder, Perri Katherine Ingram, Brenna Mc Ilroy, and Tanner Harris. 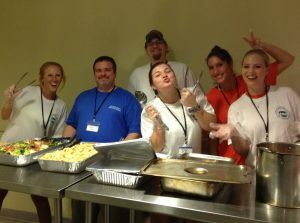 These same students are pictured serving lunch (and spirit!) to the group. There were 25 families who participated and over 100 total people in attendance.